This evening saw the final wine go into barrel, the last fermenter cleaned, everything tidied up and put to bed for the season. For the Vincent project anyhow. There's lots more going on at the winery. I'm just glad to say my wine is safely in barrel and now elevage can begin. Yes, elevage, the name of this blog, the education of the wine. It's the time between primary fermentation at harvest and bottling a year or more later, when the wine undergoes its malolactic fermentation and essentially "cures" into finished wine, much like aging meat or cheese. A common question is, "when is the wine ready to bottle?" The simple answer is when it tastes right, and perhaps when you need the space and the barrels for more wine next year. Determining when a wine is ready to bottle is a personal decision, a matter of taste and style you are looking to present. I figure most of this wine will be bottled just before next year's harvest, in part for space issues and to have wine ready for people to drink. But mostly, because I think the wines of 2009 will not make for old bones in the cellar, so they'll likely reward an earlier bottling. We see how they taste as we go, but a year from now I expect to have some delicious wine in the bottle just about ready for market. 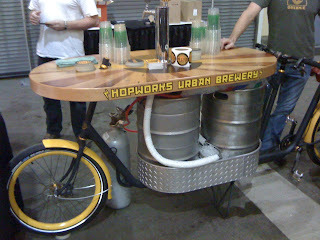 To celebrate, I enjoyed a lager from Hopworks Urban Brewery here in Portland, courtesey of their keg bike that showed up across the street for a party celebrating the handmade bike show this weekend. Two kegs on a long, gorgeous, delicious bike. What will Portlanders think of next? Today's the first quiet day in almost a month for my Vincent wine project. After getting ready for the grape harvest, bringing pinot noir grapes into the winery, fermenting the grape juice into wine, then draining and pressing the contents of all three fermenters, all that's left is to let the new wine settle for a few days, then put it into a variety of French oak barrels. So far, seven of nine barrels are full of wine from fermenters drained and pressed last week. Yesterday saw the last fermenter drained and the skins loaded into the press to squeeze out the remaining wine. Today, there's nothing to do but wait until tomorrow when those lots of wine are put into barrel. I expect the free run wine from that last, one ton fermenter to give me 2 barrels of wine plus a little extra. Yield isn't an exact science. One of the earlier barrels isn't quite full, so that can be topped off with a few more gallons. Any remaining free run wine and all the press wine from this lot will go into a variable capacity steel tank. I have my first five barrels of pinot noir tonight, all free run wine from the Domaine Coteau vineyard on Walnut hill. Two fermenters worth, and they taste pretty promising I think. The press wine from this lot is still to come, and the free run and press wine from my one ton of Zenith vineyard pinot. That's finally dry and showing some size, which should be a hit with many tasters. All done Thursday? Let's hope so. All three fermenters of pinot noir are in negative territory, meaning below zero on the brix scale. Brix measures soluable solids in grape juice, most of which are fermentable sugars. Even though it's not exactly right, we think of brix as the measure of sugar. As sugar gets converted to alcohol during fermentation, brix drops. Because of a few things, including the presence of alcohol, brix actually gets into negative territory before a wine is completely "dry," meaning it has no more fermentable sugar. So "going negative" is good because fermentation is almost done. One big worry of winemakers is a stuck fermentation, when fermentation ends before all the sugar is gone. That can lead to all kinds of problems, so going negative means you're almost home safely. Not quite there, but close enough to get excited. When everything you're making is negative, it means you're definitely close to the end of the hard work of harvest and that's really exciting. Yesterday two of my three fermenters were drained and the skins pressed. Now there are three bins of wine to settle. One for each fermenter, and a third for the press wine. Tomorrow those will all go into barrel. Tuesday the last fermenter will get drained and pressed, and probably Thursday into barrel. Put bungs in all the barrels, wash up everything, and harvest will be officially done. Exhale. The crush of crush is past peak, like nearly every fermentation in the winery. Just looking around it's obvious. Space on the floor is opening up as bins begin to be drained, the pomace pressed, the new wine settled before being put in barrel. Workers have a bit more room to move around. Things aren't done, not at all, but there's progress and surely plans are afoot for an end of harvest celebration in a few weeks. The wines for my project look to be safely in barrel in one week. Pressing for the first two fermenters is scheduled for Friday, the third on Sunday. Those first two are both "negative" meaning they're just about dry, when all the sugar's gone and the wine is made (though hardly finished). The trick now is to push them to completion as they've slowed considerably and the temperatures have dropped into the 70sF. The fruit for the third bin came into the winery four days later, but it's nearly negative after a surprisingly quick fermentation. Hopefully not too quick. Earlier this week I managed to slip and bang my right ribs onto the edge of a big plastic container. It knocked the wind out of me for a moment, and hurt pretty badly. I hoped I'd only bruised myself, but I walked around outside for a minute and thought I was ok. Four days later I'm not feeling so good and guessing I have at least one broken rib. It's left me pretty uncomfortable where almost any task is painful or filled with the anticipation of pain. Things could be worse, but don't do something like this. It's not fun. I don't know if the doctor can do much for me, but I guess I better go see him just to know what's really going on. Happily, I'm feeling very good about how this harvest is going. After anxiety about the hot summer weather and then dodging most of the forecated rain around harvest, the grapes looked and tasted really good. Then came worries about whether everything would go well with vinification, and so far it looks like the team's doing a great job. What I tasted today from the first two fermenters is very promising. Lots of berry fruit and some meaty richness, but no pruney overripe flavors or lack of freshness, something hot years can give. 2009 isn't proving to be a typical hot year, and that's a good thing if you ask me. There's one other fermenter that's beginning to get active. It's hard to believe that everything should be safely in barrel in about 10 days. I'm excited. The two fermenters of pinot noir are humming along. One's down to 10.2 brix (percent sugar, essentially) as of this morning. The other's at 12.6. And what about those temps. Cap temperatures are at or slightly above 100F, which is pretty hot and called for pump overs to aerate and cool the juice. Cap temps refer to the temperatures in the raised up mass of grape skins. They can be deceptively hot. It's not like everything in a fermenter is that temperature. Sure enough, underneath the cap the juice itself was a good bit cooler. One bin was 86F and the other 90F, again pretty warm but this is the peak of fermentation and I'll be happy to preserve what heat I can to keep the yeast active to finish the ferment well. Sometimes I get a little nervous about the ferment getting too hot, but soon enough it's back to worrying that things aren't staying warm enough to finish. It's always something. Meanwhile the third fermenter, from the Zenith vineyard, is warming up with the help of two aquarium heaters. The idea is to let it go until it takes off (begins to ferment) on its own. We'll see how long it takes. Happily, there's nothing else to worry about after this one. And I'm in that nice position of not running this winery, meaning I don't have all these bins of fermenting grapes to worry about. Maybe some day, but for now it's not so tough being a small fry. Two of my three fermenters are actively fermenting. Well, one more than the other. We had a heating plate in one fermenter overnight, and then it was switched over this afternoon to the other fermenter. The first one seems to be going pretty good, the second one should take off over night as the juice temperature warms up. Again, think of bread dough. A warm place helps the dough rise. The third fermenter, from the Zenith vineyard, is still cold soaking. The fruit came in cold and didn't need any cooling. Now it's slowly warming up and with a little push in a day or two it should start fermenting. Meanwhile, I saw lab numbers on the juice samples we sent to ETS in McMinnville. Considering the hot summer, the numbers look pretty good. Definitely lower sugars and higher acids (lower pHs) than 2006, also a hot growing season, but definitely not the ideal chemistry of last year. That simply suggests we'll have nicely ripe wines with soft structures but not the excessive alcohol or softness of other hot years. Take that as a very broad generalization. Who knows how things will turn out. One nice thing is that both of these lots have high tartaric to malic acid ratios, meaning there won't be a big loss of acidity in the malolactic fermentation process. Also, there are nice levels of nitrogen in the juice samples that suggest the yeast should have plenty of nutrition to ferment to dryness. All in all, things look good. The cool and dry weather is about to end, meaning most people have picked their red grapes here in the northern Willamette Valley of Oregon. Some whites are still out there, and some red I'm sure. It's only October 12, but after the hot summer and gorgeous weather the last few weeks, it's hard to imagine pinot noir getting much better after a predicted week of rain coming up. I'm glad all the grapes from my project are in. In the winery, my two fermenters from last Tuesday's pick have started to ferment naturally. I'm not so much against added yeast. Great wine comes from that. I'm just fascinated by spontaneous fermentation. Who knows if it's yeast from the vineyard, from the winery, or what. It's just interesting to see grapes ferment without added yeast. That's not to say things aren't helped along, mostly with heat. I compare it to putting your bread dough in a warm place to rise. You heat up your fermenters and they begin to ferment. Pretty simple. I'll come clean and admit we added a little acidified water to each fermenter to bring down the sugar level almost a full percentage point. Nothing drastic, and in some ways of thinking it's so little, why bother. But it helps in a year of dehydration to return some of that lost liquid. Now it's two punch downs a day for the active bins until they're past their peak fermentation, then down to one a day until it's time to press. The bin of grapes that came in two days ago is still soaking so it got a pump over today to get oxygen into the juice to feed the yeast and to mix up things up to get a good sample for the lab to see how much sugar, acid, etc. is in the juice. Let it rain. In a couple of weeks everything should be safely in barrel. That will feel good. What a satisfying day. Today saw the last pinot noir in at the winery, including a ton or so of Pommard clone from Zenith vineyard for my label. Gorgeous fruit, big clusters but not such large berries. Rather, lots of middle and sometimes tiny berries, more than I ever remember seeing on a cluster. Flavors were sweet and ripe with nicely tart acidity. For the second harvest in a row, Zenith fruit is the best I've seem. Nice job Tim Ramey and company. One of my two bins of pinot noir from earlier this week smelled pretty strongly of acetone this morning. That's not uncommon during cold soak, and is something that will cause winemakers to "kick off" fermentation. The ethyl acetate that gives this nail polish remover smell comes from apiculata yeast that usually start wild fermentation. They operate well at cold temperatures, but don't tolerate alcohol and die off once fermentation gets going in earnest. The ethyl acetate they produce apparently gets metabolized during fermentation, or whatever happens, the smell goes away pretty quickly. After the bin was punched down it didn't smell anymore, nor several hours later in the day. I think there was just a little activity on the surface. We'll kick off fermentation tomorrow. No worries. So now I have three fermenters of pinot noir safely in the winery. No more worrying about the weather, now it's all about vinifying the grape juice into wine. Lots can go wrong, sure, but this is good fruit and I'm confident all will go well. 2009 should produce delicious wine, and that's the right way to start a wine business. So I have two bins of pinot noir soaking in the winery. I'm swamped at my "real" job but nothing much happens during the cold soak. Light mixing of the skins and juice each day, maybe a pump over to mix things up for a good sample to take brix and ph readings, which change after havest as any dehydrated grapes give some suger into solution and potassium buffering the ph up a bit. Brix is a bit higher than I'd like at 25.4. It's the price of waiting an extra week to harvest, as sugars rose modestly but flavors seem to really come on strong. Acidity is still strong, but the ph reading and final brix will come tomorrow when a juice sample is taken to the lab for a full analysis. We'll see how much malic acid is in the juice vs. tartaric acid. Since malic acid converts to lactic in the ML fermentation, raising ph, the more malic, the more you can expect to see a ph shift up. If there's lots of malic and not so much tartaric, an extreme example, you might consider acidification with additional tartaric to ensure balance in the finished wine. I'm not guessing that will be required here, but we'll see. Another important number from the juice analysis will be glucose and fructose content, a better measurement of sugar to predict final alcohol levels. As things are, a winemaker's inclination might be to add water to bring the sugar level down a bit, maybe to 24.5. You might think that would dilute the wine, but it doesn't do that, necessarily. Rather, it's an intervention that might be necessary in the extreme, but something I want to avoid if possible. The question is -- intervene with acidulated water, or end up with a higher alcohol level in the wine. Yeast convert sugar to alcohol at rates between .55 to .62. If I assume a .57 conversion, and the brix is an accurate reflection of potential alcohol, I'm looking at 14.4% alcohol. Is that ok, or do you add water to bring that down? I'm inclined to want to do nothing, but if the glucose/fructose is higher still, hmm. What do you think? I'm not trying to make intellectual wine, rather a tasty drink for dinner and such. These grapes won't be going into a high end bottling. But what to do, what to do. Enough wine geekery. Any baseball fans out there? Ten years ago when I first worked some harvest days in a California winery, I remember the nice, tired feeling of driving home to San Francisco after a hard day's work listening to late evening playoff baseball games on the radio. I used to love traveling in the fall months when I could, but that's done if you're making wine. I also love baseball, and while harvest is a busy time, there are moments to catch some ball even if I can't lounge around and watch entire games. Those drives are a good memory now. Same too when I was first a home winemaker, listening to games while I picked my own grapes and then at home in the garage as I oversaw vinification, then the recent years of working harvests and having long drives and time to hear baseball on the radio. There's something sweet now about making wine and hearing a game, a connection I never made as a kid or younger adult but now consider a right and good mark of fall. I love October. Tonight, I have kid duty as my wife is out at knitting group. She's enough of a wine widow so it's only fair. The wine with dinner? 2008 Domaine La Croix Belle Vin des Pays des Cotes de Thongue, a 100% syrah bottling from the Languedoc region of France. Ten bucks locally and pretty nice gulping wine. Clearly syrah, with gummy purple fruit and a pleasant stem note, and a sweet savory flavor that's nicely balanced between acid, tannin and flavors. Worth trying again. We brought in the first pinot noir fruit for my new wine project Tuesday. 2.5 tons of a mix of Dijon clones from the Walnut Hill area of the Eola-Amity AVA. Nice volcanic soils, steep south slope, 10 year old vines, not to shabby produce in this hot year. There was definitely some dehydration in the grapes, but less than expected. The clusters were soft and more than ready to go physiologically. Flavors are pretty nice. Not much rot. Lots of leaves in the bins that were sorted out (thanks sorters!). All together, a nice start to this adventure. There's another ton on Pommard clone pinot noir from Zenith vineyard coming in Saturday, and then it's all about the winemaking process. Now, sleep. I got up early and spent the morning picking up and dropping off picking bins are a couple of vineyards around the valley. There was some light rain overnight, but that should be the last precipitation for about a week, possibly longer. Forecast temps aren't quite as high as a few days ago, so we look to be getting the perfect mild weather anybody wants at harvest time. Dropping bins is the necessary task that most growers require, meaning you need to provide the bins the fruit will be delivered in. Sometimes growers provide their own, but often you reciprocate by returning them. One way or another, it means lots of transport time in the middle of busy harvest work in the winery. This morning was beautiful, the fall colors beginning to come on, the drive a nice chance to see lots of vineyards, who's picked, who hasn't, how do canopies look, like that. Tonight, in memory of where I worked the 2005 harvest, I opened my lone bottle of 2005 Evesham Wood Tempranillo Willamette Valley. This fruit came from the Illahe vineyard near Dallas, in the area as the well known Freedom Hill vineyard. 2005 was the first year Evesham Wood produced tempranillo, and the first time I had even heard of tempranillo being grown in the Willamette Valley. It's not common, but there are vines here and there. I was a little afraid to open this wine, honestly. When I tried it on release, it seemed pretty reduced. I bought one anyway to see how it would turn out. The fruit came in moderately ripe, perhaps seeming a little less than optimal. That young wine didn't impress me much. Now? This is beautiful. I should have bought more. Nice dark but translucent color, with a varietal aroma of tobacco and mixed fruit and maybe some toasty oak. There's no shortage of tannin here, but they're ripe and the juicy fruit and tobacco flavors are really nice. What a great testament to locally grown tempranillo from a moderately ripe vintage. 2005 saw some good rain at harvest, but so many wines turned out wonderfully, this being no exception. There's no trace of underripeness, just nice balance. Evesham Wood does it again. I have a bottle of the 06 Tempranillo that I'll save a while yet. I may have missed out on '07, but I'll be on the look out for '08 when it's released. Can this producer do no wrong? Tonight we made a light vegetable stew with corn, red pepper, tomatoes and green beans. Add in Basmati rice and pan fried Carlton Farms thick cut pork chops, and I thought a nice red Burgundy would be the right match. Indeed. Blagny is the red appellation in the Cotes du Beaune that, if white wine, is known as Meursault or Puligny Montrachet. Confusing, yes, but I find that this appellation can provide terrific value in quality red Burgundy. This 2001 Martelet de Cherisey Blagny La Genolette is mature ruby in color, with an excellent fragrance of pie cherries, undergrowth and hummus. The flavors are similar, with bright acidity and fine tannin that turns a bit drying on the finish. Still, this is real red Burg with a changing aroma, a silky texture and great flavors that marry wonderfully with dinner. This may not have the refinement of top bottlings, but it's everything I hoped it would be. A quick web search suggests you might find this wine for a bargain price, and I'm thinking of stocking up. Also note, the top of the cork was covered in black funky mold. I wondered if the cork had leaked, but instead I suspect this bottle sat for a few years in the producer's cellar uncapsuled. I find this with Loire wines sometimes. The cork was otherwise pristine, meaning the top was affected by sitting in a cellar before being labeled. That may at first look suspicious, but ultimately it's a great sign of provenance. I finally got a little more dirty today at the winery, sorting a few tons of syrah and grenache from southern Oregon and cleaning up the line, which can be fun the first few times of the season. The fruit looked and tasted good. Now the sun's out and mild weather's setting in for a nice long stretch. People were picking last weekend, but now things are going to go into high gear with the bulk of the pinot noir crop coming in this week. For me, it starts tomorrow morning early with a run to drop bins at the vineyard we're bringing in Tuesday. I'm more than ready to get going. I've been blogging and Twittering about the great weather we're expect this coming week. Today was pretty nice too after some light rain early. The afternoon was cool, sunny and dry, just want we really need to get ripe flavors without much more sugar acculumation. Looks like the coming week will be relatively warm, which should push sugars up higher. It's not great, but definitely better than rain. Looks like we'll pick the vineyard on Walnut Hill in the northern part of the Eola-Amity Hills on Tuesday. That's 2.5 tons for my project, several more for my custom crush facility. Then the Zenith pick should be on the schedule for Saturday, October 10. I tasted a sample the Pommard clone juice from this site this afternoon. Flavors are developing, sugar is around 22.8 brix, another week should make things perfect. I'm really excited. All told, the coming week will be very exciting for me. Let me know if there's anything in particular you're curious about regarding harvest. One, he's really into Pearl Jam's new record. I've only heard the single, The Fixer, and at first I thought it was some soundalike band doing a bad impression of Pearl Jam (never my favorite act). But wouldn't you know it, the song's growing on me. After reading Scott's impressions, I'll have to check out more. Scott was a radio and music industry heavy in a former life, so he's got lots of stories about rock and roll, Pearl Jam no exception. What a life. Two, I take no small pride nodding in agreement with his post from the other day on waiting to pick this harvest. I love Scott's wines, and I've both wondered why so many people are picking so much so early AND what if I'm crazy wanting to wait because isn't that what the big jam and alcohol wine producers like to do? (well, not entirely, but hopefully you get the point) Turns out Scott and I are completely on the same page. Sugars aren't that high, acids remain strong, flavors still need time in general, why not hold off until next week. Turns out the weather's going to be great, so it should work out beautifully. That wasn't so clear a few days ago. If we were producing lots of wine, I'd want to be harvesting some grapes by now because there are ripe grapes out there, and there are logistics to consider - you can't pick everything on one day, you've got to space things out, and it's good to have a mix of things for blending purposes. But I'm not, and I find it reassuring to see Scott waiting. I'm also looking forward to reading more on his blog as harvest progresses. Keep it up Scott.